Phishing, Vishing and Smishing are tactics, attempts or strategies used to obtain sensitive information and details such as usernames, passwords, credit card details, bank details etc. often for malicious reasons and disguising as a legitimate source. While their sole aim is to trick people into giving personal information or make payments, Phishing, Vishing and Smishing can be done in different ways. Let's discuss these in details. Phishing is an attempt used to obtain sensitive information and details such as usernames, passwords, credit card details, bank details etc. 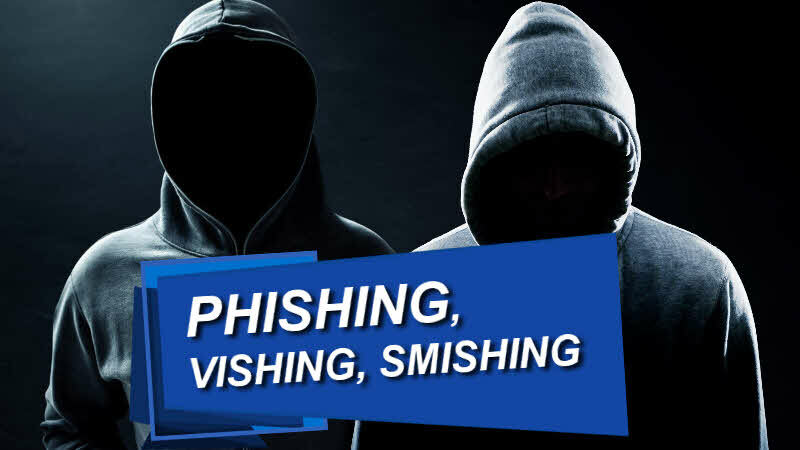 Vishing says, it is is an electronic fraud tactic in which individuals are tricked into revealing financial or personal information to unauthorized persons. Smishing is a form of criminal activity using social engineering techniques. If you want to learn how to prevent phishing, vishing and smishing attacks, you need to understand what is phishing, vishing, smishing and the types of phishing attacks. The sources of Phishing, VIshing and Smishing attacks often appear to be too good to be true as they pose via an electronic communication system (emails, website, phone calls, text messages) as a recognizable trustworthy organization, company or a brand. Every day, many people fall victim to these scams, losing their data, money, and properties. The trio plays on the terms of "phishing" in which fraudsters contact people via text messages, social media, emails, or phone calls to lure them into compelling but fake websites. Very often people agree to provide their sensitive information to these websites, believing they are legitimate. While their sole aim is to trick people into giving personal information or make payments, Phishing, Vishing, and Smishing can be done in different ways. Cybercriminals create websites that mimic a company or a brand one is familiar with, for example, your bank or favorite online store. Usually, such fake sites try to lure users into entering their account details or ask to provide additional information. Sometimes fraudsters even request for a particular amount of money to use a service. Social media accounts like Twitter, Facebook, and other channels are another avenue for pulling off the crime. Bad actors create fake accounts with fake usernames or "clone" an official account with the intent of scamming people and making them believe it’s the real account. In cases where people complain about a particular product, fraudsters ask for more information to trick people into thinking they are talking with a customer service representative. Email phishing is another effective technique to trick users into visiting bogus websites. Such emails often require urgent action: confirm your subscription, login to your bank account, or click a link below to get an exclusive offer. These website links ask for sensitive information like login details, personal information, banking details and at the end of it all, defraud people. Some criminals defraud people by sending a text message (Smishing) or placing a phone call (Vishing). They can pretend to be an estate manager, a bank officer or choose any other title that sounds convincing to the public. People fall for such scams quite easily because many of us still lack the basic cybersecurity knowledge and don't know how to recognize a malicious intent. There is always a problem with grammar (especially when it comes to spelling), poor image quality, and chaotic graphic design. "Dear" or "To our valued customer..." is an indicator you are facing a phishing email. Companies that ask more information typically address their customers by their full names. Email addresses that are created by fraudsters often look fake at first glance. A proper email address, especially for legit businesses doesn't contain irrelevant information, codes, numbers and also, does not use Google or Yahoo mail. In an offer looks suspicious, better double check it on the Internet or go directly to the brand’s website rather than clicking on the link provided in the message. If you have come this far, it means that you liked what you are reading (Phishing, Vishing and Smishing).